Strawberry is an important commercial crop in California primarily grown on the Central Coast in Watsonville, Santa Maria, and Oxnard production areas. 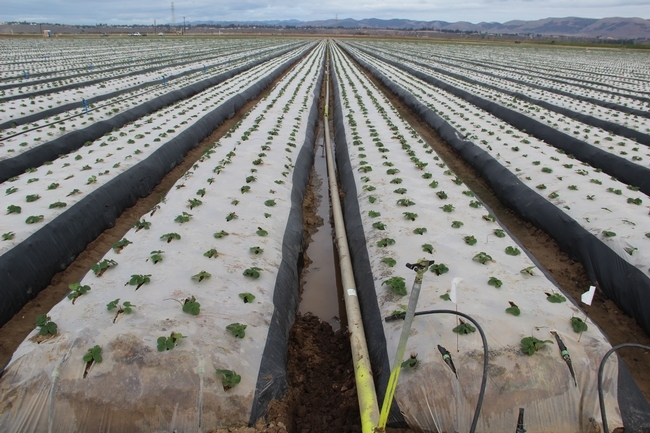 Strawberry crop requires 24-29” of irrigation water for a typical production season based on fall plantings. Irrigation is primarily administered through drip tapes installed under plastic mulch during bed preparation. In addition to the drip irrigation throughout the crop life, supplemental irrigation through overhead aluminum sprinklers is administered during the first few weeks after transplanting. Overhead irrigation is practiced to leach out salts from the root zone and to support the establishment of new transplants. 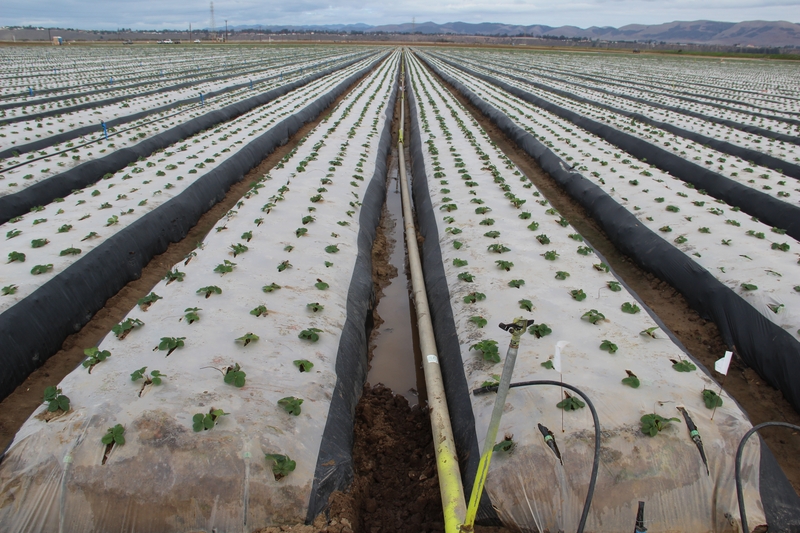 Strawberries are sensitive to salinity and this supplemental irrigation is believed to reduce or prevent salt injury. In the Oxnard area, overhead aluminum sprinkler irrigation is considered very important to prevent dry conditions which could result from Santa Ana winds. However, overhead aluminum sprinkler irrigation requires a significant amount of water and can be an inefficient system. Evaporation, limited surface area for water penetration due to plastic mulch on the beds, and potential run off are some of the disadvantages associated with this overhead sprinkler system. Water is an important resource for growing plants and it has become scarce due to epic drought conditions in California. 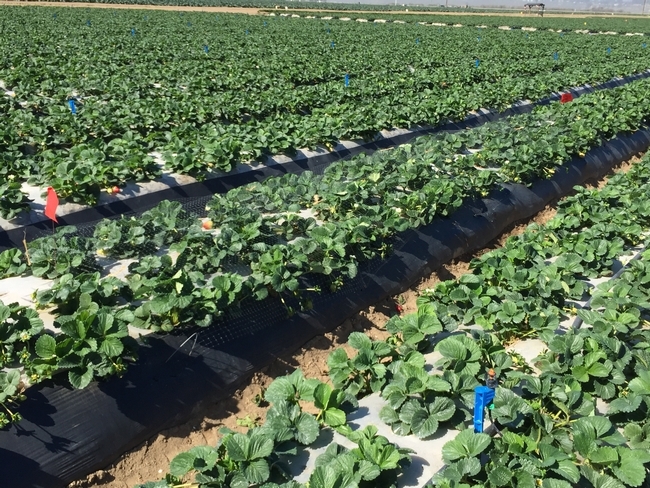 Conserving water through improved irrigation practices is a critical area for maintaining acreage of a lucrative commodity such as strawberry. Micro-sprinklers, which are commonly used in orchard systems could offer an efficient alternative to conventional aluminum sprinklers. Micro-sprinklers, established on strawberry beds, can deliver water in a more targeted manner with minimum or no run off. They could also help modify the microclimate in the strawberry canopy and create humid conditions that discourage spider mite pest populations and promote predatory mites which are sensitive to dry conditions. 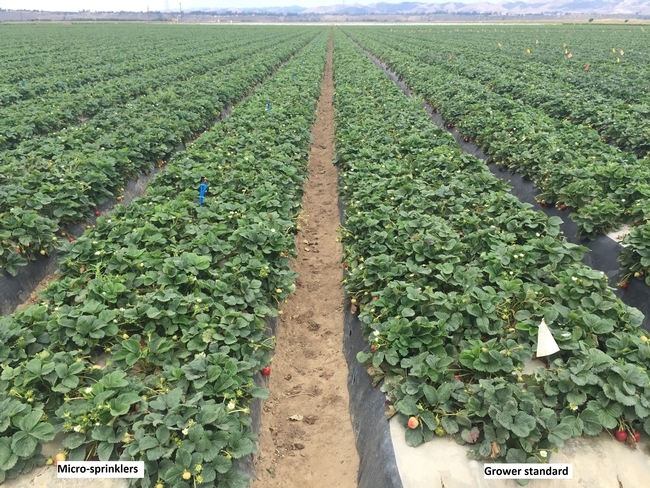 A study was conducted at Manzanita Berry Farms in Santa Maria during 2014-2015 production season to evaluate the potential of micro-sprinklers in strawberry production. Objectives of this study included i) conservation of irrigation resources without affecting strawberry plant growth and fruit yield, ii) impact on pest and predatory mite populations, and iii) impact on powdery mildew and botrytis fruit rot. A block of strawberry (variety BG-6.3024 planted on 6 November, 2014) was divided into two parts with beds aligned from south to north direction. The west half of the block was assigned for micro-sprinklers and the east half for the grower standard with aluminum sprinklers. Each block had about 60 beds (about 306-365' long) and aluminum sprinklers were established in furrows every 40' (7-8 beds in between) while micro-sprinklers were established on every third bed. Micro-sprinklers were placed 16' apart (on every fourth bed) and had a 15' spacing within a bed. Within each treatment section six 20' long plots were marked to measure plant, pest, and disease parameters. Irrigation – Conventional sprinkler irrigation was made 14 times from 6 to 29 November, 2015 at a rate of 125 gallons per minute while micro-sprinkler irrigation was made 1-3 day interval at a rate of 40 gallons per minute using 35 PSI pressure. During this period, aluminum sprinklers delivered 120,000 gallons of water over 16 hours of total irrigation while micro-sprinklers delivered 81,600 over 34 hours of total irrigation. This translates to 32% of water saving in just 3 weeks and could be more in situations where overhead irrigation is administered for extended periods. 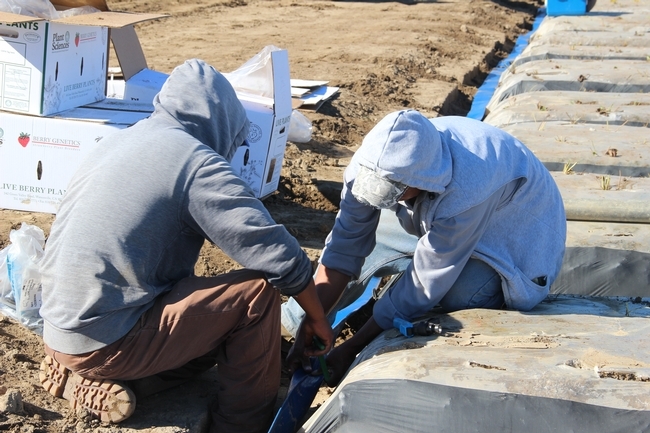 Micro-sprinkler irrigation was continued for 15 min twice a week for the rest of the production period. Distribution uniformity could not be measured in grower standard treatment in this study, but it is believed to be between 50-60% at 70 PSI based on other studies. 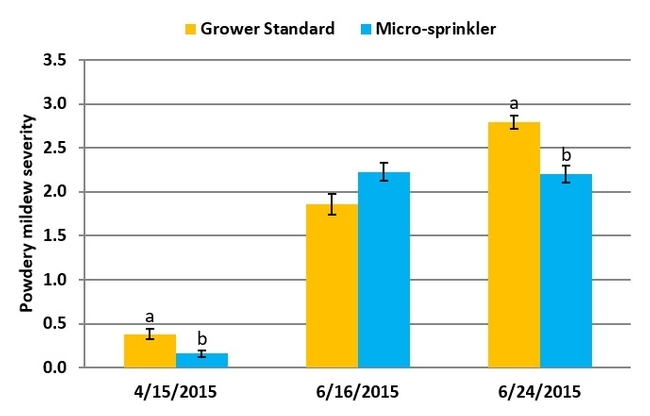 Distribution uniformity for the micro-sprinklers was 74% at 35 PSI when measured on 16 January, 2015. 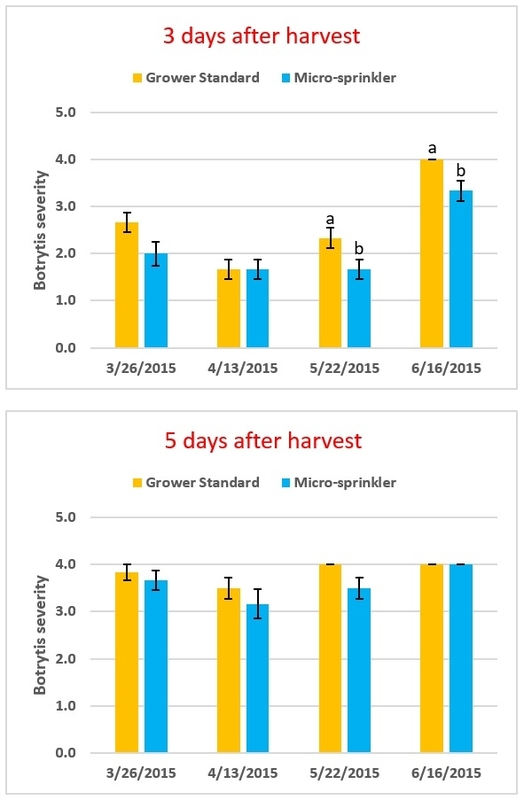 When electrical conductivity (EC) was measured on January 1 and February 1, 2015, it varied between 0.47 and 0.49 dS/m in grower standard treatment and was at 0.54 dS/m in micro-sprinkler treatment. 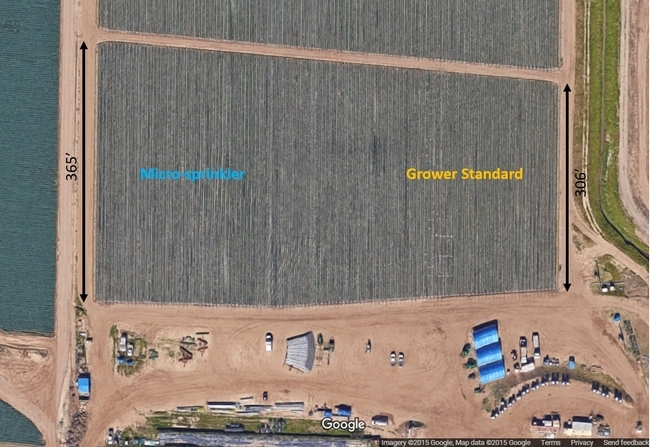 Although EC in micro-sprinkler plots was significantly higher (P < 0.0007) than in grower standard plots, it was within the safe limit of 0.7 dS/m. Cumulative volume of water delivered in micro-sprinkler and grower standard sections of the field. There was a saving of 38,400 gallons per acre in just about three weeks. Yield – Total and marketable berry yield data were collected 2-3 times a week between 7 February and 12 June, 2015 for a total of 34 sampling dates. There was no significant difference in total or marketable berries (P > 0.05) when the seasonal averages for grower standard and micro-sprinkler plots were compared. 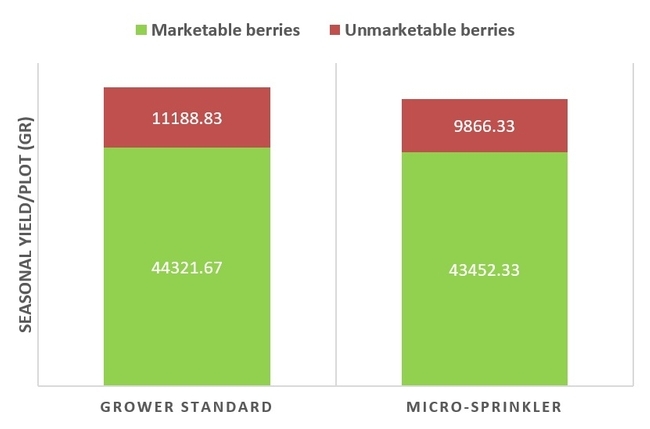 During the observation period, 44,322 gr (97.7 lb) and 43,452 gr (95.8 lb) of marketable berries/plot were produced in grower standard and micro-sprinkler treatments, respectively. Plots were covered with netting for exclusive harvest data collection. Total strawberry yields (marketable and unmarketable) per plot during the study period. Plant canopy and health– Growth was recorded by measuring the width of the plant canopy across and along the bed from 20 random plants per plot on the 6th of each month from January to March, 2015. Plant health was monitored at the same time by on a scale of 0 to 5 where 0 = dead, 1 = weak, 2 = moderate-low, 3 = moderate-high, 4 = good, and 5 = very good. 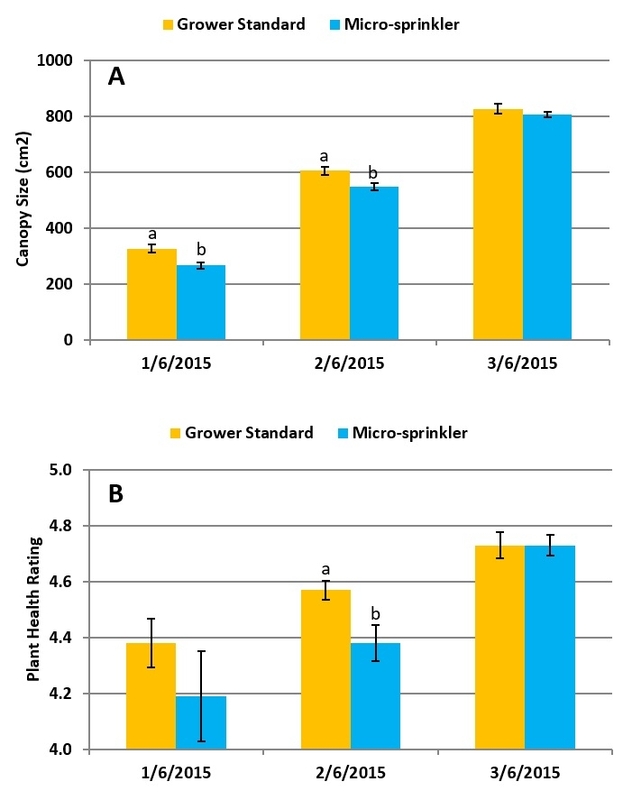 Plants in micro-sprinkler treatment had significantly smaller canopy in January (P = 0.004) and February (P =0.0006), but caught up with the grower standard by March (P = 0.14). Plant health rating during this period also followed a similar trend, but the differences were significant only in February (P = 0.02). Size of the plant canopy and plant health condition from January to March, 2015. Twospotted spider mite and predatory mite – One mid-tier leaflet was sampled from each of the 10 random plants within each plot and the number of eggs, nymphs, adult pest and predatory mites were counted using a mite brushing machine. Sampling was made once a month from February to April, 2015, but due to sparse numbers and uneven distribution useful data could not be obtained. Powdery mildew– One trifoliate leaf from 20 random plants within each plot were collected and checked under microscope for mycelial growth and powdery mildew severity was rated on a 0 to 4 scale where 0 = absent, 1 = 1-25%, 2 = 26-50%, 3 = 51-75%, and 4 = 76-100% of leaf area with infection. Sampling was made on 15 April and 16 and 24 June, 2015. Powdery mildew severity was significantly less in micro-sprinkler treatment on 15 April (P = 0.009) and June 24 (P = 0.01). Severity of powdery mildew on three observation dates. Botrytis fruit rot – Berries harvested from each plot were kept at room temperature in plastic clamshell boxes and disease severity was measured 3 and 5 days after harvest using the 0 to 4 scale used for powdery mildew. Observations were made on 26 March, 13 April, 22 May, and 16 June, 2015. In general, botrytis fruit was less severe in micro-sprinkler treatment, but significant difference were seen 3 days after harvest for samples collected on 22 May and 16 June (P = 0.02). Severity of botrytis fruit rot when observations were taken 3 and 5 days after harvest. 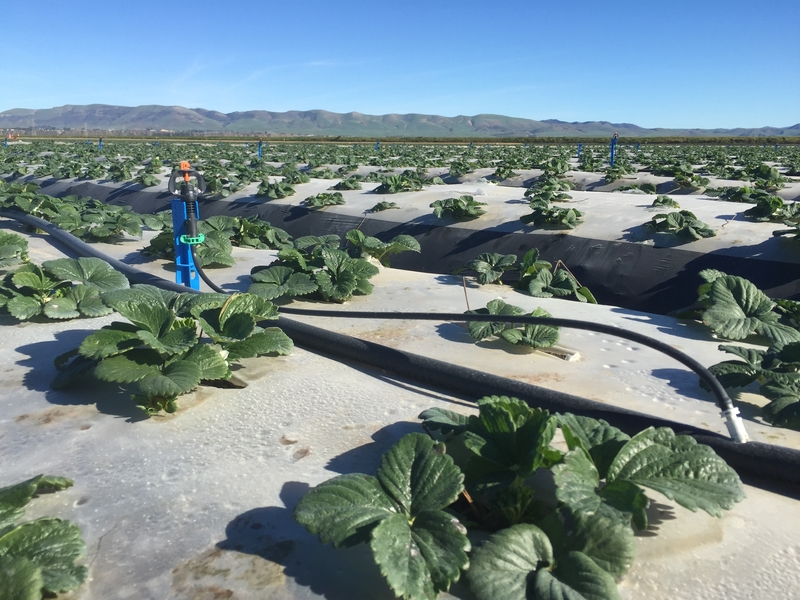 Micro-sprinkler system contributed to a significant reduction in overhead irrigation water without affecting the marketable berry yield. With less pressure required to deliver water through micro-sprinklers, they could also contribute to energy savings. EC value of below 0.7 dS/m suggests that micro-sprinklers were as effective as aluminum sprinklers in leaching out salts. Due to the lack of sufficient mite infestations, the benefit of micro-sprinklers in spider mite management could not be determined. Data also suggest that powdery mildew and botrytis fruit rot could be reduced by micro-sprinklers, but additional studies are required to confirm these preliminary observations. An initial estimate by the vendor suggests that equipment and handling costs of the micro-sprinklers are more or less similar to those of the aluminum sprinklers. Acknowledgements: Thanks to Dave Peck, Manzanita Berry Farms for his collaboration, Chris Martinez for his field assistance, Manzanita field crew for help with planting, irrigation, and yield data collection, Danilu Ramirez, Fritz Light, and Tamas Zold for their technical assistance, and RDO Water and Netafim for partial funding of the study.